New year, same deal: If you like these updates and want them sent straight to your inbox, subscribe in the box in the upper righthand corner of this page. Thanks for staying up to date with Black Lab Sports! We hope 2019 is off to a great start. Congratulations to our friend and resident artist Gail Folwell on her most recent public art commission. Selected from a pool of 100 applicants, Gail will create a statue in Des Moines, Iowa that commemorates RAGBRAI (which stands for The Register's Annual Great Bike Ride Across Iowa and is the world's oldest, largest, and longest recreational bicycle touring event). 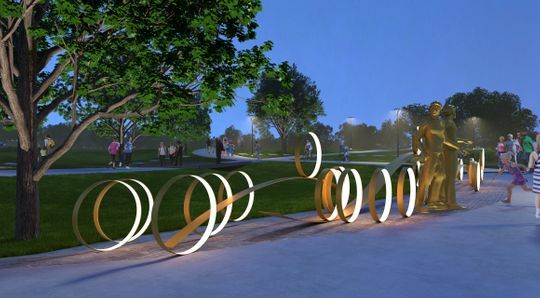 Made of bronze and aluminum, the statue will be an abstract representation of Donald Kaul and John Karras, Des Moines Register columnists and co-founders of the event, amidst rolling hills and bicycle rims. About her commission, Folwell said, "Art, performance, music and sports bring people together unlike anything else. They level the playing field and make us realize we are one humanity; Not us vs. them, but one big party.” Eloquently put, Gail. We can't wait to see the finished creation! Read more about the history of RAGBRAI and Gail's commission here. Goally, which was founded by Sasi Movva in 2015, combines technology, behavioral and child-development science, and the shared knowledge of the Goally community to help parents give their children the best possible start in life. The team is working on a fun tool designed for kids—specifically the 15% of U.S. children who have cognitive challenges such as ADHD and autism—to become organized and independent. Learn more about Goally here. Secondly, Australian-based Frontline Mind optimizes leadership, resilience, and elite human performance for the "Frontline": elite athletes, first responders (firefighters, ambulance, and police), the military, businessmen and women, educators, and victims of natural disasters. Their agile, multi-disciplinary teams focus on complex organizational challenges and provide innovative and customized training (both live and digital) to enable teams to thrive and perform at their best. Find more information about Frontline Mind—specifically Rebecca and Mike, who are currently based in The Lab—here. We can't wait to see what else 2019 holds for Boulder's newest (and the region's finest) production studio. If you or someone you know is interested in utilizing the space to transform your creative vision to reality (and save $500 off your first booking! ), email studio@blacklabsports today. Shawn Axelrod, cofounder of Climbing Addicts and friend of Black Lab Sports, needs our help! Having been diagnosed with Wolff-Parkinson-White Syndrome (a life-threatening condition that causes his heart to beat erratically) and undergoing open-heart surgery at age 19, Shawn was recently diagnosed with early-stage congestive heart failure as well. Essentially, his heart is 25% less efficient than it should be, and continued medical attention is required. A GoFundMe Campaign was established to help Shawn with his overwhelming and mounting medical bills. If you're in a position to contribute, we ask that you consider doing so. Any amount of support makes a difference, and we want to get Shawn back outdoors doing what he loves. Thank you in advance!